Jeff Hamilton Trio — Laguna Beach Live! Originality is what versatile drummer Jeff Hamilton brings to the groups he performs with and is one of the reasons why he is constantly in demand, whether he is recording or performing with his trio, Oscar Peterson, Ray Brown, the Clayton Brothers or co-leading the Clayton/Hamilton Jazz Orchestra. Jeff’s recording, It’s Hamilton Time (Lake Street Records), received enormous airplay while reaching #5 on the Gavin national jazz radio chart. His trio’s second release, Jeff Hamilton Trio-LIVE! (MONS) was nominated by critics for best jazz recording in Germany in 1997. The trio’s second MONS release is entitled, Hands On . Hamilton House-Live at Steamers (MONS) is the trio’s 2000 release. As well as recording and performing throughout the world, Jeff also teaches, arranges and composes. Born in Richmond, Indiana, Jeff grew up listening to his parent’s big band records and at the age of eight began playing drums along with Oscar Peterson records. He attended Indiana University and later studied with John Avon Ohlen. Jeff was influenced by Gene Krupa, Buddy Rich, Mel Lewis, “Philly” Joe Jones and Shelly Manne. In 1974, he got his first big break playing with the New Tommy Dorsey Orchestra. He then joined Lionel Hampton’s Band until 1975 when he, along with bassist John Clayton, became members of the Monty Alexander Trio. He attained a childhood goal in 1977 when he joined Woody Herman and the Thundering Herd, with whom he made several recordings. In 1978, he was offered the position vacated by Shelly Manne in the L.A.4 with Ray Brown, Bud Shank and Laurindo Almeida. He recorded six records with the L.A.4, some of which featured his own arrangements and compositions. From 1983 to 1987, Jeff performed with Ella Fitzgerald, the Count Basie Orchestra, Rosemary Clooney and Monty Alexander. Jeff began his association with the Ray Brown Trio in 1988 and left in March 1995 to concentrate on his own trio. From 1999-2001, the Clayton/Hamilton Jazz Orchestra was named the in-residence ensemble for the Hollywood Bowl Jazz series. Jeff became part-owner of Bosphorus Cymbals in 2004. He is now one of 3 owners of Bosphorus Cymbals. Email MVos@Bosphoruscymbals.com for more information. 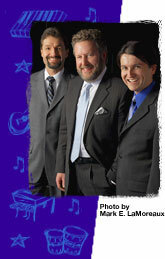 The Los Angeles Jazz Society named Jeff and his musical partner, John Clayton, musicians of the year for 2006. A banquet in their honor was held at the Los Angeles Marriott Downtown Hotel. Click here for pictures from the event. Jeff is currently touring with his own Trio, the Clayton-Hamilton Jazz Orchestra and Diana Krall. In addition to his many recordings with Ray Brown, Jeff has been on nearly 200 recordings with artists such as Natalie Cole, Diana Krall, Milt Jackson, Rosemary Clooney, Barbara Streisand, Mel Torme, John Pizzarelli, Benny Carter, Lalo Schifrin, George Shearing, Dr. John, Clark Terry, Gene Harris, Toshiko Akioshi, Scott Hamilton, Harry “Sweets” Edison, Keely Smith, Bill Holman, Herb Ellis, Barney Kessel and Mark Murphy. Jeff is a frequent guest of the WDR Big Band in Cologne, Germany. He also appeared in Natalie Cole’s Great Performances PBS special, Unforgettable and an Oscar Peterson documentary, Life In The Key Of Oscar.